Fill a tub with bubbles, then add some glow sticks. Turn out the lights for a unique bath time! Click here for some other items to use as bubble wands. You probably already have them in your house. 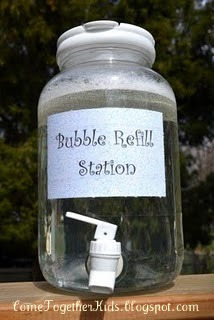 I love this idea for a bubble refill station. There are so many cute jugs and dispensers out there now. For the bubble recipe, click on the picture. *Once recipe calls for glycerin and the other for corn syrup. Both are added to give the bubble a stronger outside so it will last longer. We recommend the glycerin recipe, however be prepared because a small bottle costs about $5. The corn syrup recipe works but leaves a sticky film on hands. It’s much cheaper though. Fill a squirt gun with water and a drop of dish soap. Have them shoot at the baseboards. Clean or pick up items by color. Play basketball with the laundry. Set up three baskets; lights, whites, and darks. Have the children shoot the clothes into the correct basket. This works for toys too. Give them the tools. Little kids like kid-sized tools and can use them easier. Older kids can use adult size cleaning tools. What kid doesn’t love a Swiffer? Create a special name for your cleaning crew. Allow your child to be the “inspector”. They can look at your work and give you a pointer or two. Put socks on little hands for dusting and wiping windows. You can even decorate them to be “dust monsters”. 10 minute clean ups are great for the end of the day. Set a timer for 10 minutes and see how much you can get done before it rings. Take a “coffee” break after completing some chores. Use pretend play. If you want your child to help with dishes, play restaurant. If you want your child to deliver things to different rooms, play post office. Don’t forget to have a special treat for a job well done! There are chores and then there are responsibilities. Kids need both to keep the family running smoothly. Click on the picture above to visit Smart Mom University for a list of age appropriate chores and responsibilities.